New Draper Fire Chief Clint Smith presents Unified Fire Authority Chief Dan Petersen with a flag. 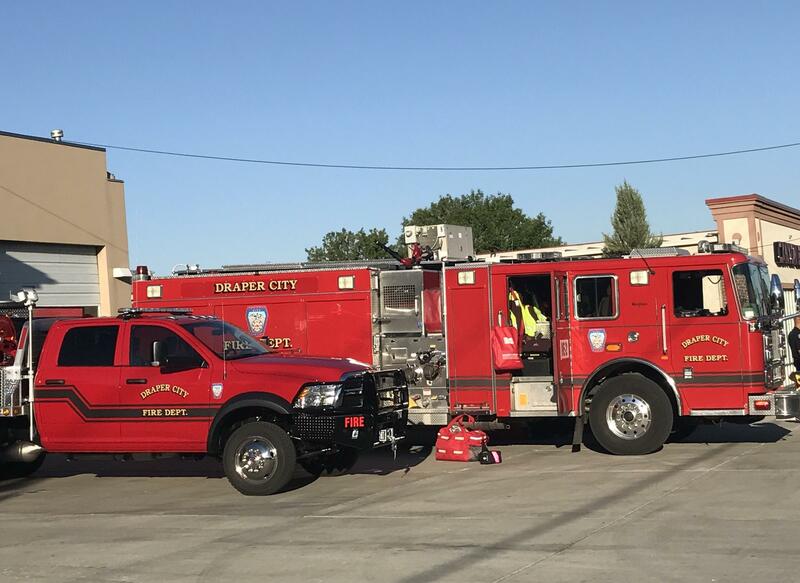 UFA transferred service of the community to the newly-formed Draper Fire Department on June 30, 2017. Since 2004 the Unified Fire Authority in Salt Lake County has been serving cities that don’t have their own fire departments. Friday, for the first time, a city ended its contract with UFA and started its own fire department. Draper’s brand new fire department begins serving the city at a risky time. It’s hot, dry, and firework season is just beginning. 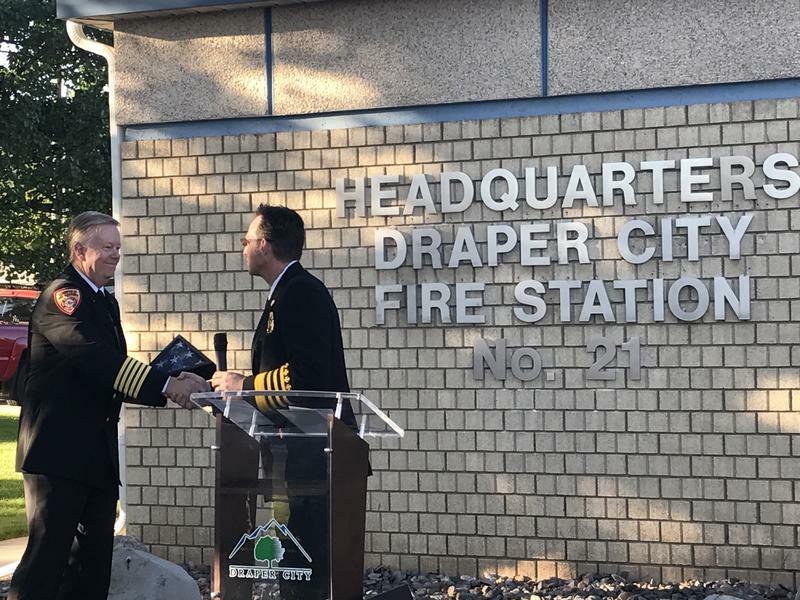 “All you have to do is turn on the news each night and see that we’re in a challenging time in terms of the fire season,” says Clint Smith, Draper’s new fire chief. Despite the danger, Smith feels the 37 full-time employees of the new fire department are ready. Draper has miles of mountainside interface, which worries Smith and other city officials around the July holidays. Most of the city is firework-restricted. The new chief hopes that will be enough to prevent a disaster. Draper Mayor Troy Walker says he had no complaints about the service provided by Unified Fire. He’s been advocating for the city’s first fire department for nearly a decade. Last summer the city council voted to reevaluate its contract with UFA. The new fire department’s operating costs are roughly the same amount the city has been paying for fire and ambulatory contracts with the county, about $5.5 million. Walker says the city has been putting aside money for years and was able to purchase two brand new fire engines. A third engine and other equipment was purchased from Unified Fire. The Brian Head Fire grew slightly overnight but firefighting officials are hopeful that calmer winds and a bit of rain on Sunday will slow the fire's growth. The fire is 42,800 acres and 8 percent contained. Evacuations remain in place for Brian Head, Panguitch Lake, Horse Valley, Castle Valley, Rainbow Meadows, Mammoth Creek, Beaver Dam, Blue Springs, Dry Lakes and Second Left Hand Canyon. 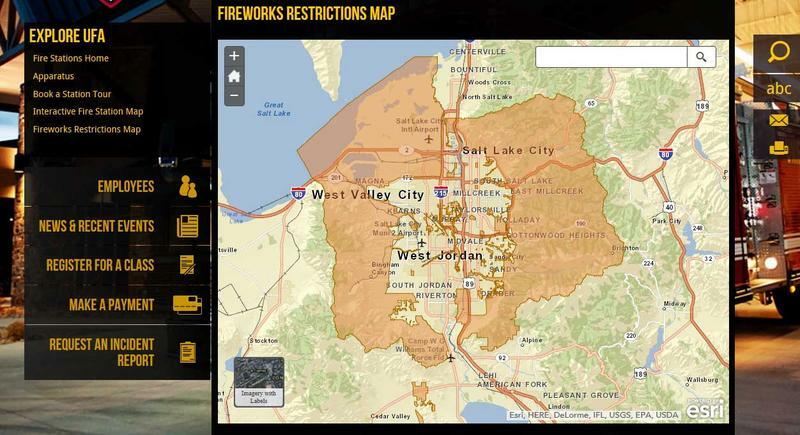 Salt Lake County’s Unified Fire Authority is planning on a busy 4th of July weekend. 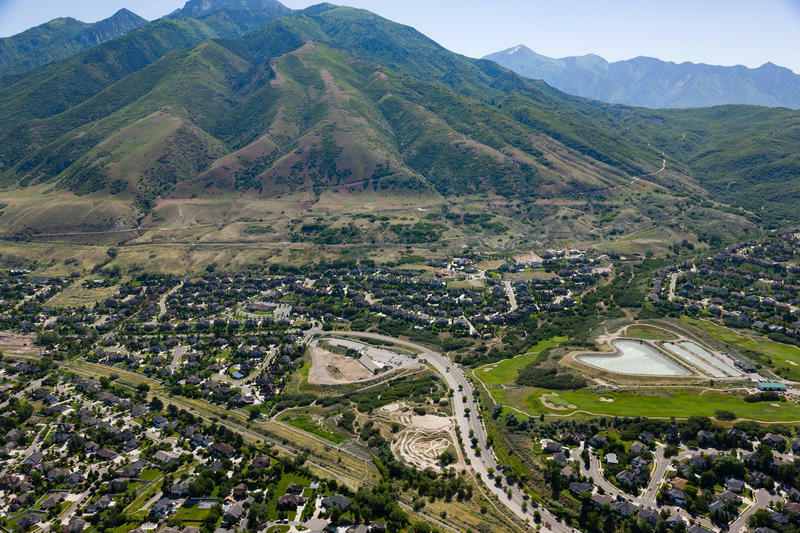 The Draper City Council delayed a vote Tuesday on a proposed housing development near the borders of Highland and Alpine. 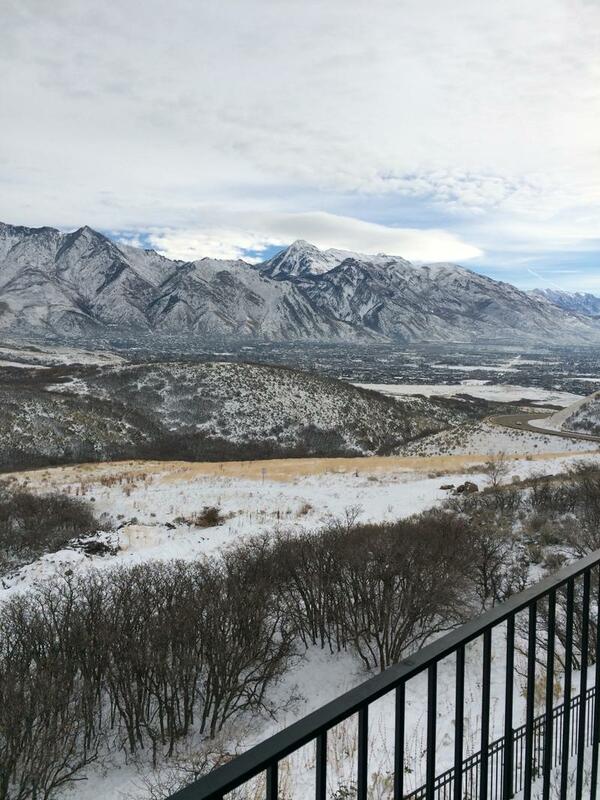 Council members say they want to show residents they’re serious about protecting open space. The city of Draper has received a $10,000 grant to provide youth suicide prevention programs to the community.